The weather hasn't been particularly delightful this weekend. In fact, it was pouring down this morning and on Sunday morning. Very unusual for Sydney. I don't mind a bit of rain, especially when you don't have to go anywhere. I love waking up on Sunday morning hearing the rain pouring down outside, knowing that I can stay in bed and don't have to get up. Too bad it also rained cats and dogs this morning and I had to get to work. This soup adapted from Donna Hay is perfect for a rainy day inside. It's healthy, filling, warm, comforting and tasty. The original recipe uses a whole chicken and no stock. This is the best way to make the real thing. However, you'll be fishing for bones for ages and the chicken skin contains a lot of fat. Usually I leave the soup in the fridge overnight and scoop of the fat the next day, but this time I wasn't that patient. I wanted to eat this soup immediately. I used chicken thighs instead. Filled with Kale, Zucchini, Cherry Tomatoes, Carrots, Celery and Fennel, this soup is the ultimate flu buster. Donna's recipe has Cavolo Nero, a Tuscan Kale, in it. But it is unlikely you'll find this at your local Coles or Woolies. I replaced it with normal kale which was just as good. Another change I made was leaving out the spaghetti. Including pasta in your soup can make the soup a full meal, however, sometimes it makes the soup thick and starchy. I like my soups clear with big chunks of meat and vegies in it. I have used a lot more vegies than Donna, but hay (get the pun?) there can't be anything wrong with that! If you make double the quantity and put the soup in the freezer in separate portions, you'll have your lunch sorted for the next few weeks. Enjoy! Heat the oil in a large saucepan over high heat. Add the onion, garlic, half the carrot, half the celery and the bacon. Cook, stirring, for 4–5 minutes. Add the chicken, thyme, rosemary, bay leaves and stock and bring to the boil. Reduce the heat to medium and simmer for 1½ hours. Add the tomato paste, cherry tomatoes, salt and pepper and cook for 5 minutes. Add the remaining celery and carrot, the fennel (and pasta - if you like) and cook for 5 minutes. Add the zucchini and chicken and cook for a further 2 minutes or until warmed through. 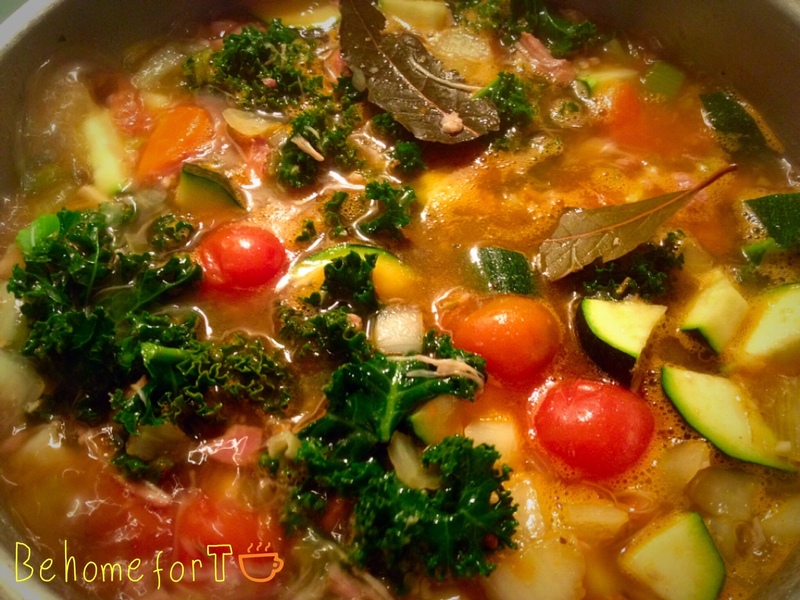 Add the kale to the soup and cook for 1 minute or until just wilted. Divide the soup between bowls and sprinkle with salt and pepper to serve.